The DOTA 2 3D Map Model is sure to captivate audiences wherever it is located. This diorama will be the centerpiece of any DOTA 2 gamer's dream game-room. The phenomenal detail showcases each individually designed element, from the Ancients, barracks and towers in each base down to the forgotten bones of old enemies strewn along the side of a forest path. Each model is hand-finished and assembled by artisans and model-makers, including a beautiful hardwood case with decorative inlay. Lighting is designed to highlight the lava flows, crystals, bases and other dynamic elements. There are three models available, the DOTA 2 Full-Size Model, the Radiant Model, and the Dire Model. Fulfill your ultimate DOTA 2 game-playing experience with this one-of-a-kind collectible. All models are built with stained hardwood and include an acrylic cover. The Full-size model includes an electrical light box that highlights various features throughout the map such as lava flow, the Ancients, barracks, and towers. There are 381 individually designed elements from the game using 39 different vivid colors. Every element has been painstakingly designed to match the in-game model. All map elements are manufactured with advanced 3D printing technologies, to ensure maximum precision and detail. For a project the size of the DOTA map model, it's really a matter of going in and figuring out how you can divide the work to get multiple people working on it. Everyone has different specialties. We're trying to work towards those strengths. We have designers who are particularly good with fine-detail work, and other with strengths in sculpting organic elements, like the trees, grasses, etc. Other designers excel at pulling an asset from the game and converting it so that it can be 3D printed. When assembling the map, we split it into 30 separate sections, mostly between the Radiant and Dire factions, and had individual designers work on each section. The designers would take the individual assets we had prepared in advance, and place them one at a time into each section. With eight designers tirelessly working together on the map for six months, we needed people who are going to be good at organization. One of the hardest tasks was taking all these individual elements, and making sure everything fit together correctly. Designing 3D models for printing is quite different from designing them for a game. Oftentimes video game assets are optimized for a single view. You know - you're expected to look at them only in this specific direction. And that means that oftentimes there are areas that are not fully realized or detailed. In some cases, there is no 3D geometry, it's all just flat images. As a designer, we have to change that from a flat plane that has little definition to something that's completely 3D from all perspectives. We spent a lot of time trying to make everything as close to the original game design as possible. We would have the game running on one screen, and screenshots for reference on a second screen, and would use those together as we sculpted and created 3D print-ready models. We concentrated a lot on features for the Radiant and Dire bases. We used lighting throughout the map to draw attention to important elements. In the bases, we particularly emphasized the Ancients, the barracks, and the towers, we really tried to emphasize those. All of the structures had a great deal of detail work. For example, the shops where players buy power-up items, all of the shops are fully modeled with incredible accuracy. We actually increased the size of some of the more important elements in order to be able to include high detail and have it show up in the 3D prints. We used high-end industrial 3D printers that allow us to print in full-color, at resolutions as small as a human hair, so we had the opportunity to really make these elements look amazing. The players spend most of their time in a DOTA game in the Lanes and the Jungle, so we really wanted to make these look good. A model like we are doing always involves a certain amount of interpretation. It is impossible to 3D print an exact duplicate of the in-game features. We would have each designer look at their section, and try to design it to look as close to what was actually in-game as possible. For example, if there was a jungle that had three red trees in the game, then we would make sure to put three red trees in that grouping in the model. There are certain constraints that we have to follow in 3D printing a map like this. For example, a tree standing all by itself might not be strong enough in the 3D print, so we tried to balance that by adding plants and extra tall grass around those lone trees to get just a little bit more strength. At one point we had considered modeling some of the elements of the map using traditional hand-modeling techniques, perhaps using plastic trees, or flocking for grasses, stuff like that. But as we designed the map, we came to a unified decision that we wanted to use 3D printing for every element of the map, in order to maintain the highest quality and appearance. There is a lot more time required up-front to create a fully 3D printed map, but in the end, the added consistency and visual quality was worth the extra effort. The DOTA map has a lot of 'minor' elements that might not be immediately obvious. We did a lot of work incorporating these sorts of elements. We pulled a lot of assets directly from the game that would be just scattered around the map. Generally they are tiny, oftentimes you barely even notice them. There might be a pile of bones next to the path or a group flowers or, the blades of grass or really just any little details like that - a crack in the dirt, a little bit of lava or light peeking through. Adding these sorts of details really makes the map model feel like a true DOTA experience. For example, some of the bushes had little flowers on them, but not all of them. Things like that, just gave it a little pop of color every once in a while. There was a lot of effort put into the appearance of the Lanes, and I thought that was important because that's the main part of the map - if you're going to notice anything you're going to notice the Lanes. Fixing colors in the Dire Ancient - with the textures that were in-game, the 3D print of the Ancient would have come out solid black. So we had to go in and emphasize some of the colors and brighten some of those effects so we could actually see them in the print. We spent time on pretty much every asset making it look really good in the print. How long did it take to build the Dota Map Model? 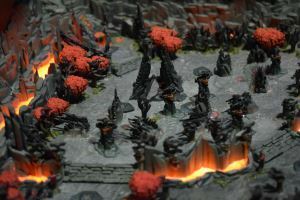 The 3D models of the DOTA map were created by a team of 8 designers over six months. To produce each unique full-size model, it takes over 30 hours of combined 3D printing time, and 32 hours of manual assembly. The map is 3D printed in sandstone-like material; the base comes in a variety of attractive stained hardwoods, or you can select a custom treatment. If you can think it, most likely we can build it. If it is simple changes for a particular type of wood base or the color of the wood stain, this would be a very minimal charge. If you want an all-metal box or larger version, then the customization pricing would be much more significant. You can contact us with your ideas and we will give you a firm quote for pricing. Before any fabrication occurs, we will reach out to you to see if you would like any customized amenities or features built into your product. Can I order a larger model? Yes, if you want a super-sized model, we can do that. Need a 15'x15' model? No problem. Please contact us for a quote. What is the wait time from the day I order it until the day it arrives at my doorstep? We would like to have 4-6 weeks of production time. If you need it in a hurry, please contact us and we will do our best to accommodate your needs. How are these shipped and what are the shipping charges? The full-size model is shipped via common carrier and will be placed into a specially built shipping container. The smaller models, Dire and Radiant, will be packaged then shipped via one of the common services (FedEx, UPS, USPS). For continental USA customers, all shipping will be Free. For the rest of the world there will be shipping charges of $250 for the full-size model and $100 for the radiant and dire models. No. Our 3D printers print in full-color (up to 750,000 colors). They are built with a sandstone-like material and then have a very special matte finish applied. Will WhiteClouds be building different versions of the map? If we have enough interest from the Dota community, we would certainly consider doing so. What happens when Dota changes the in-game map? This doesn't happen very often. Very much like the car industry or smartphone industry, the model may become outdated. You don't need to upgrade your model. If you would like the most recent model, we can sell you an upgraded model for a discounted price. What version of the game is this for? The map model represents the game as of the 7.07 (Dueling Fates) release. In October 2017, Valve stunned the industry when they announced a partnership deal with Shapeways allowing licensing of their content to be 3D printed. As a Shapeways printing partner, and owning the worlds largest capacity of full-color 3D printers, we have a lot of experience creating and printing all sorts of 3D models. WhiteClouds has 3D printed figurines for DOTA in the past, as well as for Halo, Smite, and many other major entertainment brands. When the Valve license opened up, we wanted to come up with something unique, and go beyond just printing more figurines. With our experience in creating 3D printed gaming and entertainment content, and producing large dioramas, we decided to produce a one-of-a-kind gaming collectible, something that no-one else could pull off. WhiteClouds' indistrial 3D printing technology, can print full-color models with incredible detail. Our 3D printed entertainment models show incredible detail. The resolution of our printers is finer than a human hair.